Bank Islam Brunei Darussalam (BIBD) will add two new products to the BIBD NEXGEN universe – BIBD BizNet and QuickPay – to bolster Brunei Darussalam’s move towards a fully cashless society via seamless transactions. The two new upgraded systems will be launched today during the TechXpo 2018 at the International Convention Centre (ICC) in Berakas, said Head of BIBD Retail Banking Hajah Nurul Akmar binti Haji Md Jaafar in a press conference held yesterday at the BIBD Head Office in the capital. Also attending the conference was Chief Operating Officer Dr Gyorgy Ladics and Head of Corporate Banking Koh Swam Sing. “Besides the direct benefits of going paperless such as having a documented, secured and digitised economy with cost savings and reducing dependencies on physical cash and receipts, these initiatives support strategies under Brunei Vision 2035 in promoting the national growth of entrepreneurism that will invigorate a more vibrant private sector, create more opportunities and develop greater competitive strength,” BIBD said in a statement. “In line with the national aspirations, BIBD NEXGEN and the ecosystems powered by it will digitally connect everyone, forge alliances and create conveniences such as improving the ease of doing business, creating a more progressive and pro-business economy,” the statement added. 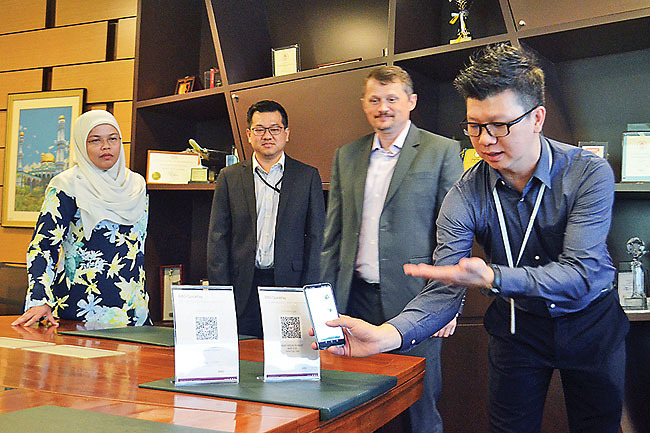 The BIBD BizNet banking platform app provides corporate customers along with government-linked companies in Brunei Darussalam mobile access to the BIBD BizNet web-based platform. Launched earlier this year, BIBD BizNet is an upgrade to its previous digital Corporate Internet Banking platform that provides day-to-day accounts and payments operations support with real-time account access along with a collection of other enhanced features. These include single security token access for Parent and Subsidiary accounts, payment approval, fund transfers and bill payments along with information such as foreign currency rates and branch/ATM locator and other services. The new BIBD BizNet service and mobile app brings affordability and convenience to BIBD MSME account holders, supporting businesses, especially budding entrepreneurs, with better and easier financial management of their businesses while providing flexibility to their business operation. BIBD QuickPay service, meanwhile, is the latest upgrade to the BIBD NEXGEN mobile application. The service is designed to cater to the needs of businesses, especially MSMEs, new start-ups and other budding businesses requiring transaction services but do not have the capital to invest in the latest cash register or point-of-sale machines. The cost-friendly service builds on BIBD’s existing eTunai platform for seamless digital transactions without the need for physical terminals to accept cash and card payments to produce sales receipts. With the three-step payment method of scan, pay and confirm, payments are made instant when BIBD customers scan, using the BIBD NEXGEN mobile application, the merchant’s designated QR code. To be able to use the new QuickPay, BIBD NEXGEN mobile users are advised to update their app to its latest version (v 3.8.0), available both at Google Play Store and App Store. Adding to efforts to promote financial management among entrepreneurs, BIBD also recently launched its BIBD MSME Account which only requires a minimum opening and average monthly balance of only BND50, much lower than the usual requirement imposed by other banks. The facility is specifically designed to accommodate the needs of micro, small and medium enterprises. BIBD NEXGEN is the bank’s revolutionary mobile-led digital banking concept that harnesses the latest innovations in artificial intelligence, machine learning, data analytics and customer insights. BIBD recognises that the future of banking is not only digital but specifically mobile-led, especially for Brunei Darussalam where mobile penetration and interaction are the highest in the region. Banking services will be more accessible through the platforms powered by BIBD NEXGEN which will de-cash the economy through enhanced interconnectivity and multi-industry alliances, the BIBD statement noted.